Our industry leading online procurement system enables you to simplify, streamline and control your ordering. It provides clients an easy way to process their orders, whilst also allowing the visibility and control of order flows from a department, location or organisational hierarchy. Fundamental to the system is an extensive catalogue that is simple and easy to use, allowing users to search and navigate quickly to their desired items and execute their orders with ease. This catalogue can be tailored to each client’s requirements, even departments or locations within the client organisation. 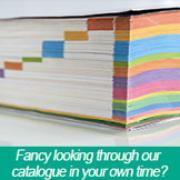 This can range from simple bespoke catalogues to extensive multiple catalogues including client specific products. At an operational transactional level, various order paths, authorisation rules and budget controls can be implemented to control visibility of products to users and provide guidance towards a preferred product list or manage non-essential expenditure. The Image online ordering system provides immediate real time visibility of expenditure at multiple levels, allowing clients to quickly identify and highlight key expenditure areas. This can be tailored to the client to incorporate budget and cost centre reporting and controls. We also appreciate that in some instances our client may have their own internal procurement systems and we have extensive experience of working with and integrating to such systems. This ranges from SAP and Ariba, to other more bespoke e-procurement systems. This may include the provision of catalogue and product content data, through to “punch-out” or full “round trip” interfaces.